Aeroplan members can now start earning miles across the full automotive customer journey on all Toyota and Scion vehicles in Canada. As part of its new partnership with Toyota Canada Inc. (TCI), Aeroplan members can earn the following: Purchase/Lease – members will earn a minimum of 5,000 miles and be eligible for bonus earn on the purchase or lease of any new Toyota. Members will earn 7,500 miles on the purchase or lease of a Scion and 2x the miles on the purchase of a Scion iM. 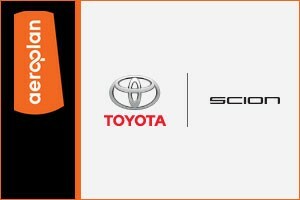 As a limited time bonus offer, members can earn 2x the miles on the purchase or lease of a new Toyota or Scion vehicle – that’s up to 50,000 miles on select vehicles; Test Drive – members will earn 250 Aeroplan Miles for test driving a new Toyota or Scion vehicle; Service – members earn one Aeroplan mile for every $2 spent at Toyota service centres on customer paid services on Toyota and Scion vehicles. To celebrate the launch of the new partnership, Toyota will be offering Aeroplan members 2x the miles on customer paid, eligible services on Toyota and Scion vehicles for a limited time.